Soooz Says Stuff: Welcome to Sharon Gerlach author of "The Secret Dreams of Sarah Jane Quinn"
Welcome to Sharon Gerlach author of "The Secret Dreams of Sarah Jane Quinn"
Please welcome To May Movers and Shakers Promotion author Sharon Gerlach; author of "The Secret Dreams of Sara Jane Quinn." I write in the free time I have after the day job (financial aid advisor at a public college) and the family (husband, three grown children, and a buttercup – also known as a granddaughter). People have called me a romance writer, but I really don’t think that describes what I pen. I like to go beyond the first fluttery feelings of romance, beyond the “being in love” euphoria, to the real meat of the relationship: bills, not enough money to pay them, the challenges of living together, the insecurities that lead to bad decisions. In other words, I like to write about real life with a dash of hope thrown in. That is not to say that my stories always have happy endings. Let us just say that they have happy enough endings. 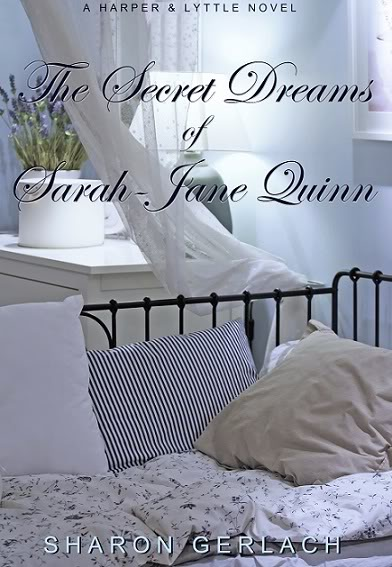 Sarah-Jane Quinn has many secret dreams: to own the bed-and-breakfast inn where she stayed as a child; to finally capture the elusive Coleridge “Collie” Tate, on whom she has an enormous crush; and most importantly, to be someone’s top priority for once in her life. But Collie is a single father with a potential custody battle on his hands, and Sarah ranks roughly Number 917 on his list of concerns. So when Gus Haldemann, the sophisticated director of Human Resources, shows a marked interest in her, she finds it not only flattering (and mystifying), but decidedly tempting and irresistible. And then Sarah is brutally attacked by a violent stalker. In the aftermath, she must re-evaluate her priorities and decide which man reaches deepest into her heart – and let the other go forever. Love triangles. I find them frustrating. Not necessarily in an awful way. They just stress me out. Make me hedge on who I want the heroine with. Bite some nails. That kind of thing. Well, usually. Sarah's crush, Collie is introduced. And I'm in lust. Want Collie. Dear God, give me a Collie of my own. Then Gus is introduced. And I'm in adoration. A warmer, fuzzier kind of lust. I kinda want Gus, too. I can't give away plot. I want to, believe me. This is the part in which I desperately want to rave about this section and that event. But I'm trying to be a good reviewer, and not spoil. So, let me say this: The true star of this story is the voice. Just stellar. I admit, in the past, I have found it difficult to get into narratives in the first-person, present tense. Not even the faintest issue, here. Sarah-Jane is our guide through her murky love life (and lord, how she reminds me what it was like to be twenty-something and looking for Mr. Right), and her voice is strong, true, and amusing. You can't help but want her to find happiness. I instantly connected to the characters in this novel, and that connection didn't waver. And I was a little bummed when I read the last sentence. (Bonus: I didn't see the little twist at the end coming, though I knew something was up. Always a plus when I get a little surprise.) Run and give this story a read! Where can you buy "The Secret Dreams of Sara Jane Quinn."